CFR LibTour poster. Click for printable PDF version. 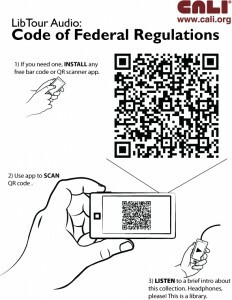 LibTour is CALI’s free law library audio tour, QR-coded. Display the codes around your library for students to scan with smartphones. They’ll instantly hear audio that introduces a common legal collection. Find LibTours listed alphabetically by topic below, by most recent here. – transcript of the audio.